The German is an amazing gardener. But….I do know how to do things that make it appear as if I’m a gardener. 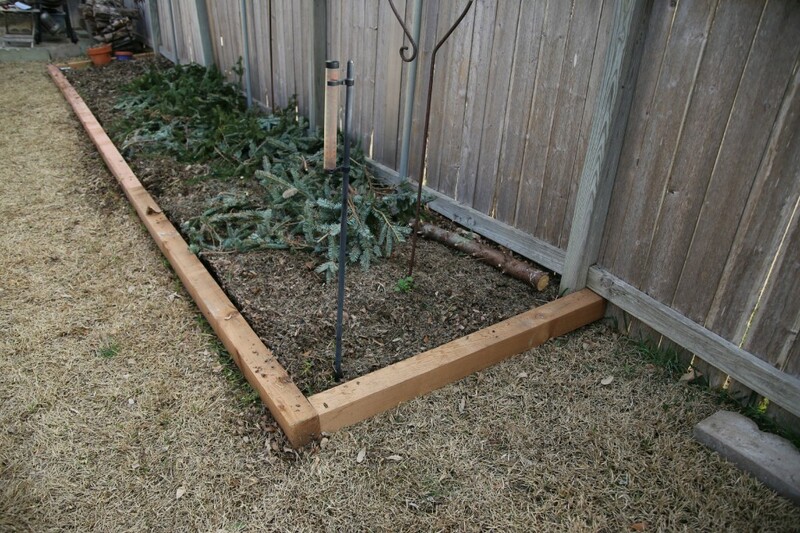 Take this easy DIY flower bed, as an example. Look at those clean cedar lines. Look at the barrier between grass and mulched goodness (yes, that is the remains of our Christmas tree in the bed). 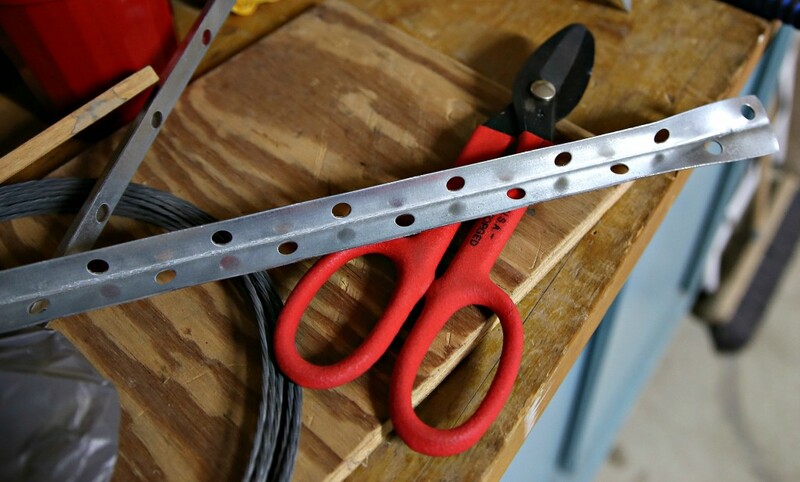 Look at one of the easiest DIY projects you’ll ever tackle. Oh, how I wished I had remembered to take the “before” pics. 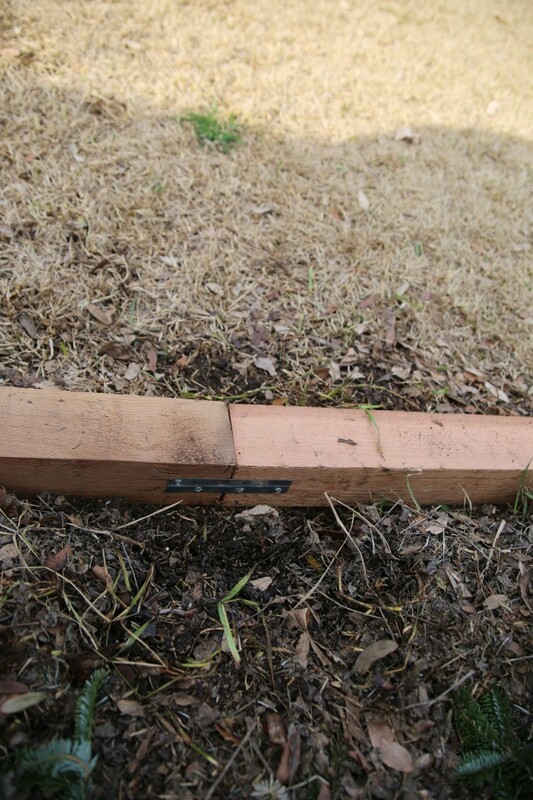 This bed was lined with double stacked garden ties, hammered together with giant railroad tie nails. The ties had deteriorated to the point that they were falling over on their sides, exposing the sharp nails points. With Dexter and his squirrel-chasing-ways and a soon to be Sweet E running this backyard, changing out the ties was priority #1. I should point out here that Husband and I working together on a DIY project is like purposely inserting your arm into a bee hive: SO MUCH STINGING! It works best when we work alone, but some projects are easier with an extra set of hands. Before we settled on the cedar (we used 4x4x8 Western Red Cedar posts), we went through a few other ideas. In the end, we chose cedar because of it’s durability without needing to be treated against decay. 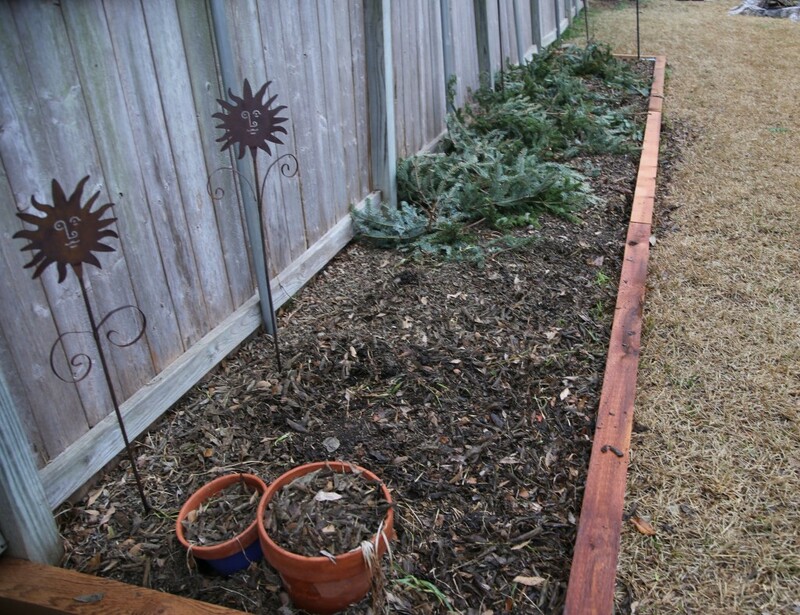 This particular cedar is strong and straight; it’s perfect for building a flower bed and should last for years and years to come without any upkeep. Our bed measured 24′ long, by 4′ wide. 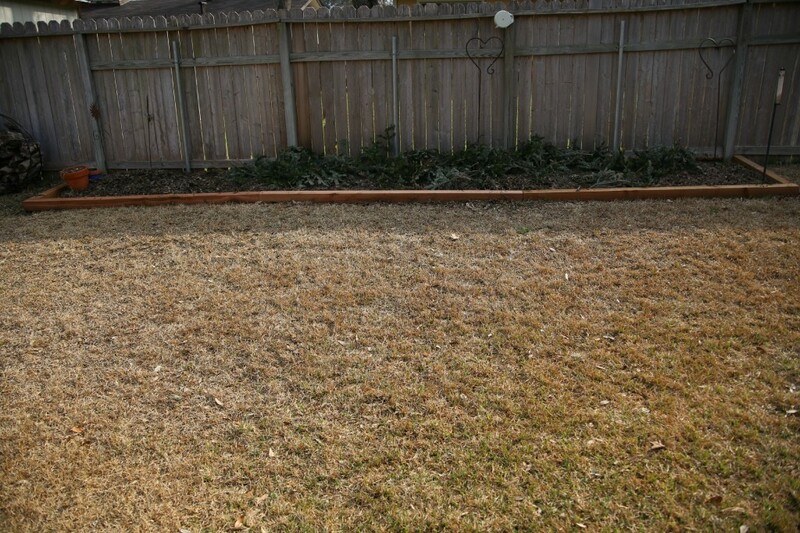 We bought four posts, using three along the front and then cut the other post in half to use on the sides. Then we used a couple of brackets Husband had laying around to connect the side posts to the front posts. We used screws instead of nails to attach. That way if we ever need to disassemble, it’s much easier to do. The three posts that made up the length of the bed were connected, on the inside, by something Husband MacGyvered out of some material that was left over from our new window installment. He used metal snips and cut a piece about four inches long, then hammered it flat, so we could use screws to attached the metal thingy (DIY technical talk) to the cedar posts. DIY, you’re doing it right! Initially, there was talk about connecting the frame of the bed to the fence, but it was secure enough as built. 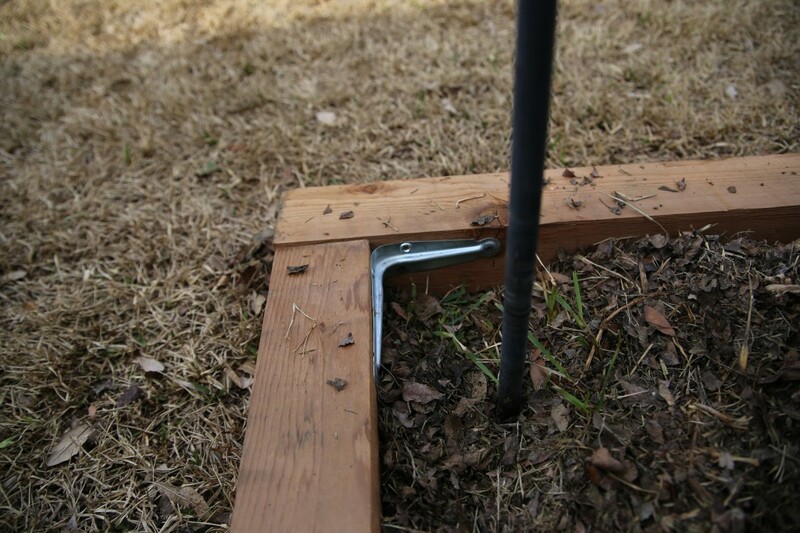 We simply laid out the posts, connected the sides to the front posts first, then connected the lengthwise posts together. We did have to dig a bit of the dirt out along the front, where the posts lined up, to make sure things were level. Because it was already an established bed, that part was minimal. We also had to back-fill a corner spot to bring up one side of the bed to achieve the aforementioned levelness (is that even a word?!). Finished! Beautiful and easy. My kind of project. The view from the other end (look closely and you can see the fire pit where OMT! 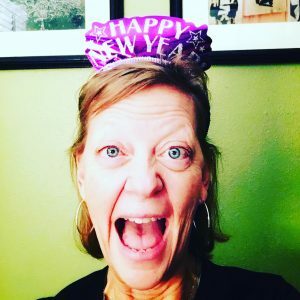 enjoys adult beverages. I swear, every time I look out the back door and see this simple, yet elegant, bed, it makes my heart sing. From start (having materials on site) to finish, including Husband’s ingenuity, we completed this project in under two hours. While we could have used a less costly cedar, the project wouldn’t have been as simple nor as quick to finish. Plus, we won’t have to worry about rot for years to come. Some things are worth the extra dough. Bonus: I count this as the first project that Husband and I completed together that didn’t feel like a beating. Love it! 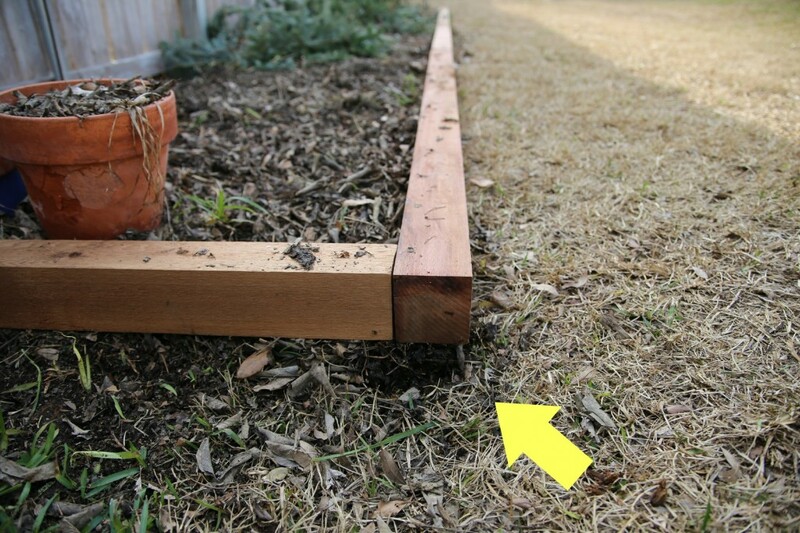 That is a really great idea for making sure those posts don’t get all wonky in the beds as things grow and it rains. We ended up using stones to edge our beds because they’re smaller, but for a large bed, this is a really pretty idea. Thanks. Each day that passes, I’m more in love with the bed. Simple. Elegant. Useful. You comment made me laugh because in our neighborhood people have yards big enough for giant swimming pools and tennis courts. We have a teeny yard comparatively. But thank you for that! So easy! I love that bed more than I can say. Looks beautiful!! I can’t wait to build one of my own someday! Thank you! You can do it. I need to make two more bed this week for my new veggies – will be using this 🙂 Thank you for sharing. We’ve decided to make one more really long veggie raised bed. Shooting for a fall garden on that one. Good luck! OH I love this! Simple, inexpensive and you’re so right – it’s going to be a color spot of many joyful moments all summer and into fall, I’m sure. I hope you post pictures again when the flowers are all in bloom. When the cannas start blooming, I’ll post! Your project is wonderful and will repay you many times over in food and self-satisfaction. I identify with the “working together with hubby” dilemma! I prefer to just give him his instructions and then hover near by, supervising. I know the problem is “me” and my control freak demeanor, but still, working side-by-side is not one of my preferences! I’m sure he’d agree if there was a guarantee I never found out what he said! Husband and I are of the same mind: We’re Both Right! Bwhahaha! Makes projects together interesting. I love working with him…as long as we both allow the other some room to be right. He’s a very think outside the box kinda guy, while I’m a do it the fastest, yet best way. I swear there should be cameras rolling. We’re planning on one more giant bed. Maybe I’ll get a Go=Pro for that project! Happy to share. One of the things that makes me happiest about this bed is the cedar. Won’t decay for 20 years! I likey! ESO!!! Here from the Grand Social, and may I say, I’m very impressed. Fast, Frugal & Functional; Fantastico! Gonna keep this one on hand so Sweetie can get an idea or two. Gracias & BB2U. Yes! All those things! I still love looking at it! Thank you for the love! That’s my kind of project!! Thanks for sharing via Family Fun Friday. I was shocked how easy it was, even with the little bit of MacGyvering that went on. Good luck! I need someone to build me a flower bed like this! Grab a friend and get to it, momma! Or better yet, find MacGyver! That dude can do anything. Thanks for the vote of confidence! We had fun building this easy bed.